NP: UFOs to Touch Ground in 2013? For many, the central theme of UFO contact has been anticipated for 2012 as a “new beginning” for humanity to finally allow admittance into the galactic order of things within our galaxy. Although no apparent signs of contact have been verified, many strange occurrences have been transpiring as of late that may hint UFO contact in the years to come. The debate is still up for grabs on whether this initial “contact” might benefit or cause grievous harm to humanity with unknown implications. The question now is based on all things present, what can we really expect from our sentient neighbors from around the galaxy? Recently last month on December 20th, a Sacramento man witnessed a strange event caught on his iPhone and telescope of a strange object in the sky circling around a nearby star or planet causing an “explosion of light.” Naturally the man called the local news and forwarded the footage hoping they would have some insight on what it could be. Surprisingly, the local media had no official statement on the weird phenomena and decided to contact an astrophysicist to examine the event in detail. With the event taken with the man’s smartphone, the images had to be severely enhanced. Astrophysicist Dr. Stephen Maran decided that “my personal opinion is that it is not an astronomical event.” The witness Elijah Prychodzko on the other hand, was sure something was amiss as he couldn’t believe his eyes on what was transpiring: “I saw something that I’d never seen before. I saw another object orbiting this — whatever it was up there, and I’ve never seen anything like that before.” He also sent the evidence to the Vatican hoping that they would have some sort of explanation as to maybe hint at some heavenly delusion. Obviously, if something was amiss beyond explanation, the media will not report any extraterrestrial phenomena knowing full well what the repercussions could be. Many would be fearful of unknown entities nearby and probably panic, not something human society needs at the moment; especially the ways things are going around the world. Even though many were quick to debunk this event as the U.S. government destroying enemy satellites, or destroying one of its own satellites, it will take an actual event including contact for those to finally accept that there is something happening within the galaxy beyond natural occurrences. 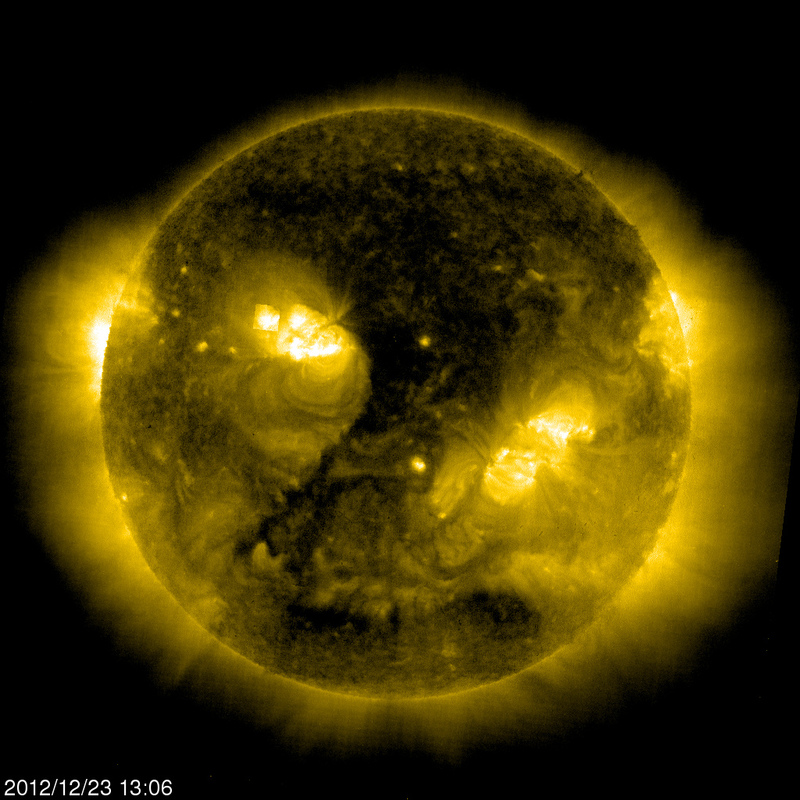 Another strange event that many are deeming a cover-up by NASA was strange events of the sun on January 2nd. Apparently, many artificial objects or alien entities were orbiting the sun. Images reviewed by NASA including SOHO STEREO, LASCO C2, LASCO C3 display different types of unidentified objects. Based on observations, these “objects” have different shapes and sizes and are in different points in space near the sun containing a material structure. The video seems very interesting in the fact that a lot of activity is seen orbiting the sun that many would deem “broken pixels, interference in the satellite, meteorites, or solar particles.” Whatever the case may be, what reason would UFOs be so close to our sun? Are they planning to alter it in anyway? Could their interaction with the sun be causing many strange events, especially the major solar storm that transpired not so long ago? Scott C. Waring from UFO Sightings Daily captured a mysterious 3D “cube” orbiting the sun on December 21st, and December 23rd. Oddly enough, this anomaly was recorded by SOHO in real time labeled SOHO EIT 284 displaying that this may actually be artificial. Waring believes that the three dimensional object is not a glitch or a pixilation due to the cube being covered by gas clouds in some of the enhanced pictures of the sun. He also believes that this object (which is seven times the size of Earth) could be a space station orbiting the sun for some unknown purpose. Several theories included an alien drone, 3D space station used to harvest energy from the sun, or helping humanity survive massive solar storms that are imminent in 2013. Whatever the case may be, these sightings have been recorded as far back as 2011. According to Waring, many scientists have been noticing this cube like structure orbiting the sun frequently and are unable to decide whether this alien structure is a threat or an ally. Obviously nothing has transpired to portray this object as a threat unless one counts the massive solar storm that occurred recently. According to reports, on January 1st, a massive solar storm occurred deemed by experts towering 20 earths. Although NASA made no implications of this being anywhere near the full strength of the sun’s capacity, a storm like this aimed at Earth could be dangerous. What could stop this 3D cube from using its harvested energy to aim a massive solar storm at Earth knocking out all communications? According to experts, this is not far from reality as at any moment, the Earth could suffer a massive EMP blast disabling all electronic devices and send us back into the Dark Ages. On the grand scale of events that could affect our planet, the most devastating would be the loss of all our electronic devices that run our entire lives. Another out of this world event that occurred in China of last year could in fact be real contact between aliens and humans. According to the Alien Disclosure Group UK or ADGUK, a UFO landed in the National Forest Park of Fuxin China where a few eye witnesses with a camera were able to capture the amazing event. Although the footage displays something that would come out of a movie, all of the information has been verified as real. The figure of a grey alien tall and thin exited out of a small craft and headed towards the witnesses after being spotted. When the group attempted to flee in terror, the camera dropped to the ground ending transmission. If this video was deemed faked, someone really went out of their way to create this amazing footage. According to further reports, the local authorities were contacted and no further information was released. For what reason (if any) would the grey have the need to land in such a public area knowing full well that humans would come into contact with them? Have they finally decided to come out in the open? Was this alien there to observe and report, or perhaps to abduct humans? Observing the full footage of the event the group spotted the UFO airborne while driving to the park for a picnic. With many reports of UFO activity being reported daily, the majority of the sightings have been explained or considered fake. Whether or not all of them can fit under this category, only one is needed to start a revolution and bring forth another change in human history. Perhaps many are awaiting the opportunity to experience contact with other sentient beings existing in our galaxy to help us surpass our geopolitical problems and give us a few pointers on how to build a new start. Currently it seems we are headed for darker times as the world economy and food crisis is currently underway. Many scientists believe that by summer 2013, the food crisis might start and riots will follow causing a societal collapse. And due to evidence displaying that perhaps humans cannot solve problems on their own, perhaps our galactic neighbors might be sought to lend a hand. Due to Hollywood propaganda and depiction of any alien race as a threat to humanity, the likelihood of trusting any alien race to help us under the guise of conquering us will still hold water. In any light due to numerous sightings and current information, perhaps December 21st 2012 did mark the beginning of a change for humanity as the coming years may herald the disclosure of alien races making their presence finally known to our small blue world. Associated Press. “Massive sun eruption could tower over 20 Earths.” NBC News (January 2013). Stephen Hanard. “Video: UFO Lands In China, Alien Walks Out, People Flee.” Beforeitsnews.com (January 2013). Scott C. Waring. “Giant Cube Recorded By NASA, Bigger Than Earth, Near Sun On Dec 21st & 23rd. NASA Source, Alien Cube First Seen In 2011.” Beforeitsnews.com (December 2012). Associated Press. “Man Captures Video Of Strange Explosion In The Sky.” CBS Local News (December 2012). Katie Valentine. “UN Warns Of Food Crisis In 2013 If Extreme Weather Persists.” Thinkprogess.org (October 2012). © Copyright 2013. James Astrada. The Nonsense Papers Series. UFO ‘Exploding’ Over California: Was It Something To Fear?